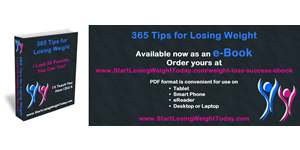 365 Tips for Losing Weight eBook gives a new tip each day to help you stay focused on your weight loss goal day-in and day-out. I lost 50 pounds in 5 1/2 months and have kept the weight off since 2001 by using these tips. A FREE eJournal, with printable pages for everything tips ask you to record and more, is available from the supporting website, StartLosingWeightToday.com. I did not use a specific program or system to lose weight, but if you do these tips will help you lose weight faster when your weight loss program and tips are used together. Losing weight is not a matter of knowing what to do. If I asked you right now to tell me what you need to do to lose weight, what would you answer? You would probably answer, without hesitating, “Eat less” and/or “exercise more”, like everyone else does. If we already know what to do, why do we keep looking for a faster, easier way? We have been bombarded with messages and products promising easy, fast, effortless ways to lose weight. We want to believe it, but deep down, we know better. I’ve been there, tried that, learned that lesson. To me, losing weight isn’t a matter of not knowing what to do, but a matter of knowing how to do it – day in and day out for long enough to get the results you want. 365 Tips for Losing Weight will help you from the first pound to the 30th pound to the 50th pound and beyond – and on to your maintenance phase too. Some tips are specific “to dos” to help you cut calories. Some help motivate you to exercise. Some teach the principles you’ll need to succeed and keep it off for life. Some help change the way you think about losing weight. All tips are about keeping your head in the game! I know my story is not typical – and neither is yours. Everybody has obstacles, some more, some less, some more serious for sure. I KNOW you can do it, because I have been where you are right now. If I can do it, you can do it. Through these tips I will teach you everything I learned through this journey – the thoughts I had, the things I did, and the changes I went through. If you’re ready to begin your journey, let’s Start Losing Weight Today!